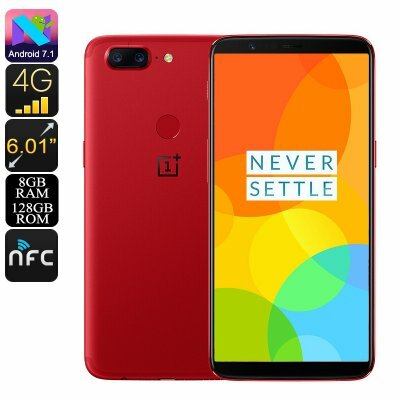 Successfully Added OnePlus 5T Smartphone - Snapdragon CPU, 8GB RAM, 128GB Memory, 6-Inch 2K Display, 4G, 20MP Camera (Red) to your Shopping Cart. OnePlus 5T Smartphone is one of the best flagship handsets from China. This stellar smartphone delivers a mesmerizing user experience and comes packed with high-end hardware. Running on a Snapdragon 835 Octa-core CPU and with 8GB of RAM, it is well equipped to tackle the most resource heavy needs. If you're a demanding phone user who runs graphics-heavy games, want to multitask continuously or like to run the latest apps without lag, dropped frames or interruptions then the OnePlus 5T is here to answer those needs. When it comes to the viewing experience the OnePlus 5T smartphone is hard to beat. It has a spacious 6-Inch AMOLED display that lets you experience games and movies in 2K resolutions. So you can take the media experience to a new level. For photography lovers, the phone boasts a 20MP dual rear camera setup that uses the Sony IMX 376K imaging sensor. This brings superb focal depth and works incredibly well even in low light conditions so you're going to be snapping photos and getting great results of memorable moments. Perfect for the budding photographers who don't want the hassle of carrying a dedicated camera everywhere they go. With the phones high-end performance and incredible camera you'll need loads of storage for games, movies, and photos, fortunate the OnePlus 5T has you covered in that department as it comes with a healthy 128GB of internal storage. To ensure you can make the most of this delightful setup is a 3300mAh battery. So you can head out with the confidence you'll have enough battery life to enjoy a full day of phone use without needing to stop and recharge. Connectivity on the OnePlus 5 is second to none, not only can you enjoy the usual dual-band Wifi, Bluetooth, and NFC but you also get a huge number of supported 4G bandwidths. This means the phone can operate on the fast 4G cellular networks and deliver uber fast data connectivity on the go in just about any region of the world. so whether you're in the US, UK, EU, AU or Asia chances are you'll be able to use your carrier of choice with this unlocked 4G phone. The OnePlus 5T Android smartphone comes with a 12 months warranty, brought to you by the leader in electronic devices as well as wholesale Android phones..